Another, and more likely contender given the obscurity is White Buffalo, a western version of Jaws where the shark is replaced by a killer bison starring Charles Bronson. I'm not a fan of Schlocky films, and thus not the biggest fan of Shlocktober, but the Nintendo tie-in trivia was great! Here's hoping for more neat tie-ins like that as the month progresses. Note the SECOND hand coming off to the side... yep, they went there haha! If Bob doesn't get around to this I'll be confused since it's the direct sequel and has a plot stupid even for a monster movie. Possibly, but I've been watching Big Picture long enough to know that it's also possible that the next couple movies are going to have nothing to do with King Kong, outside of the fact that a couple of the same people did work for the movies. I've noticed that Bob loves talking about those neat little connections between otherwise unrelated movies. Thank you for not praising this film, which is one of the worst films I've ever seen and could possibly be one of the worst movies in history overall. I was afraid when I clicked on to watch this week's Big Picture that you were going to give it enough credit to boil down to what might be considered a "positive" review. If you had, I would have lost all respect for you (although I understand that the loss of one internet cretin isn't worth a damn to you). I said it before on Escape to the Movies and I'll say it again: Thank you Bob. Interesting video, especially a bit about Nintendo and Kirby! 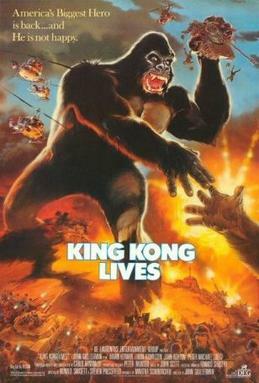 I remeber seeing King Kong when I was much younger but wasn't the best. I actually really enjoyed the more recent remake, albeit I haven't watched it since High School so it could have just been because it had dinosaurs in! They actually showed this version on TV quite a bit back when I was in middle school and early on in high school, so I have had the misfortune of seeing this one. The broadcasts stopped for obvious reasons my sophomore year and I haven't thought of the film since. Thanks for the memories, Bob! The horrible, horrible memories.